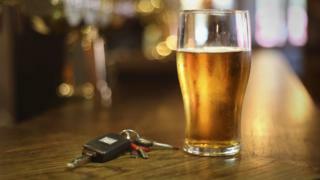 Two Welsh police forces have topped a list for charging the most motorists with drink-driving offences. New figures revealed North Wales Police prosecuted the second highest number of drink-drivers per population, while Dyfed-Powys Police was fourth. It has prompted calls for better public transport in rural areas. North Wales Police said it had a "robust strategy" to tackle drink-driving. Dyfed-Powys Police has been asked to comment. The figures were gathered by the Press Association, who issued a freedom of information request to all 45 police forces in the UK. The data covered a 12 month period to May 2017. It showed Lincolnshire Police prosecuted the most drivers per population, 14 per 10,000 population (1,035 motorists). This was followed by North Wales which made 11.2 charges per 10,000 (783 motorists) while Dyfed-Powys had 9.5 charges per 10,000 (493 motorists). AA president Edmund King said the figures could relate to poorer public transport. He added: "It could also be down to more targeted police enforcement but whatever the reasons, there is no excuse for drink-driving." Jason Wakeford, director of campaigns for road safety charity Brake, said: "Drink-driving remains one of the biggest killers on our roads, causing devastation to families up and down the country. "It is essential that police forces are provided with the resources they require to crack down on drink-drivers throughout the year." Insp Dave Cust, of the North Wales Police roads policing unit, said the force had a "robust strategy around enforcing the 'Fatal 5' offences", which includes drink-driving. "People should be aware that we have detailed tactical plans that include targeting specific areas following information given to us by concerned members of the community," he said.